Harper’s most impressive hit came during his second at-bat in the eighth inning. The team had already scored six runs in the inning. With Harper at the plate, one fan in the stands yelled, “Overrated, overrated.” On the next pitch from reliever Jorge De Leon, Harper doubled near the right-field line, scoring Matt Stairs and Alex Cora. 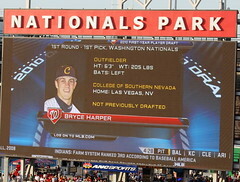 Harper acknowledged that he heard the heckling from the fan. Yes, I made fun of news services for writing about the 8th-inning at bats for young rookies and draft picks. That was when he was going 0-for-1 and just the subject of early March baseball fluff pieces. This is now turning into a fun news story to watch, at least for the spring. I know that there isn’t exactly high hopes for the Nationals this season, especially with Strasmas not coming this year, so the Will-they-promote-Bryce-Harper storyline is bound to get annoying. That’s a reason to really enjoy these stories right now, because as long as it’s coming out of the Grapefruit League, it’s welcome and optimistic. The rest of the ticker after the jump. The Ticker: Say it with me everyone: your first place Washington Capitals! That Tampa Bay losing streak couldn’t have come at a better time for the now cardiac Caps. Still, there is work to do with a long and challenging six-game road trip coming up…The Wizards are 1-29 on the road and have lost 9 of their last 10; some would say that’s not very good. It’s alright, the season is almost over, but those 36 wins I projected last fall is proving to be an awful assessment…United’s Charlie Davies has been pegged as one of the 10 players most likely to have an impact on their new teams this season…as a reminder, the Red, White and Blue Wizards are happening next year, so leaks shouldn’t be surprising (and let the record show that my attempt at the logo just had the red and blue reversed)…George Mason’s 15-game win streak came to a halt during the CAA tournament, but they’ll still make the big dance, along with the team that triumphed in the Colonial, Old Dominion. Georgetown’s game against UConn in the BigEast tournament will be wrapping up as this post goes live (hey, we schedule); with a win, the Hoyas are probably locked into a 5 or 6 seed unless they run all the way to cutting down the nets at MSG. Final Number: 68 - Don’t forget when filling out your brackets* this weekend that there are now three more teams in the field for the NCAA tournament. What does that mean for local and regional schools? Not too much as most are either pretty safely in or too far off the bubble to benefit from the extra spots, but still, consider this a PSA to fill out your bracket a few days earlier than previous years. *WAIVER: We Love DC doesn’t condone illegal things like gambling. This is all about making predictions for fun! There’s a tough balance to try and achieve with Harper. On the one hand, he’s just 18 and will need some minor league seasoning. On the other, he’s the top rated prospect among all teams and has star written all over him. I usually get on the media for overhyping but I’m giving them a free pass on this one. See you at Hagerstown for that first home game!